What was it like to grow up in colonial America? With Colonial Days: Discover the Past with Fun Projects, Games, Activities, and Recipes, today's students can experience colonial America through the lives -- and activities -- of yesterday's families! Don't let the title of David C. King's book Colonial Days: Discover the Past with Fun Projects, Games, Activities, and Recipes, fool you. 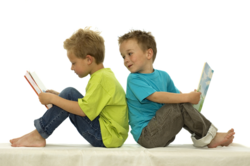 This is not just another activity book. Although it's certainly full of "fun projects, games, activities, and recipes," the book is, above all, the story of a family living in colonial America in 1732. "The Mayhews were not a real family," King tells readers in the introduction to his book, "but their story shows what life was like in colonial America." Colonial Days gives its readers the opportunity to share one year of those lives, by participating in some of the activities that kept the Mayhew family busy from morning till night, from season to season. In the spring, the Mayhew farm came to life as Nathan and his father prepared the soil and planted the crops. "They planted the grains first -- corn, wheat, barley, oats, and rye -- along with a field of flax, the plant from which linen thread and cloth are made," King explains. "They planted vegetables by a method the colonists had learned from the Indians, placing pumpkins, squash, and beans around the hills of corn." Today's students can experience life on a colonial farm as they learn how to craft a weather vane or a sundial; dye wool or weave a pot holder; plant an herb garden or a pineapple; measure a tree or prepare a dandelion salad; and make Jack Wax or maple cream from maple syrup. In the summer, after the first harvest of hay was cut and stored in the barn, the Mayhew children set off on berry-picking trips. "They filled their baskets with wild strawberries, and a few weeks later, they picked raspberries and blueberries," King tells readers. "Sarah helped her mother use some of the fruit to make jams, jellies, and preserves. They also dried some of the fruit and rolled it into sheets of oiled cloth for storage." In the autumn, the work of preparing for winter began. "Nathan and his father harvested the grains. Mrs. Mayhew, Sarah, and the twins picked apples, dug up potatoes and turnips, and hauled in the squashes and pumpkins. Most of the vegetables and apples were packed in straw and stored in the stonewalled springhouse," King says. Your students can experience a colonial autumn as they learn to bake bread, make jam, or print butter; make corncob dolls or blow bubble flowers; and play blindman's buff. They might even find time to visit the Mayhews' Native American neighbors and learn about their lives by learning to make an Algonquin drum and drumstick or to play a stick toss game. "One of the early winter tasks the children liked best was dipping candles, especially bayberry or beeswax candles. But bayberry and beeswax were scarce," King says. And "when the sun went down, even a tallow candle made a welcome pool of light, the only light the family had at night except for the fireplace." During the long, cold winter months, young modern colonists can learn to make their own candles and candleholders, print stenciled note cards, create appliqu pictures, prepare pomander balls, make Algonquin snow goggles or Mohawk bead necklaces, and play Iroquois snow snakes or jackstraws. Potpourri means "the pot that rots"? Colonists made black paint by roasting potatoes until they were black, grinding them into powder, and adding linseed oil? Yeast is made up of microscopic fungi that feed off sugar and produce carbon dioxide, which is what causes bread to rise? The game of lacrosse was invented by Native Americans? Colonists needed more than a bushel of bayberries to make a single pair of candles? Faraway objects look closer than usual when a storm is approaching? In fact, Colonial Days: Discover the Past with Fun Projects, Games, Activities, and Recipes is so full of fascinating information and easily done authentic activities that home-school teachers can build an entire American history unit around it. Classroom teachers of grades 3 and above will want to be sure to include this well-organized and well-written book in their library of resources! Colonial Days: Discover the Past with Fun Projects, Games, Activities, and Recipes is available in bookstores everywhere. If you are unable to locate it, ask your bookseller to order it for you or contact the publisher directly. 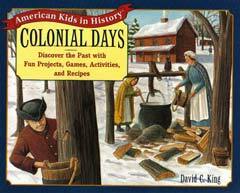 Colonial Days: Discover the Past with Fun Projects, Games, Activities, and Recipes, by David C. King, is published by John Wiley & Sons, Inc., 605 Third Avenue, New York, NY 10158-0012. Learn early American history with the biographies of America's founding fathers from the 1829 book, Lives of the Signers to the Declaration of Independence.